Favorite Things | Enuff with the Stuff – Sort Stow and Let It Go! This item is one that I recommend to just about every client. It’s best for its ease of use and compactness. To see others options and why this one came up tops read my blog here. 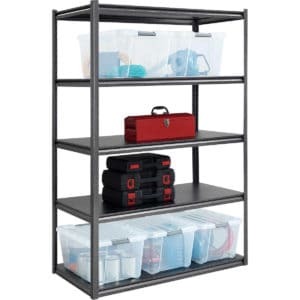 Many clients call me in to help with their basement storage areas or their garages and these shelves are the ones I always recommend. They are sturdy, easy to assemble, flexible in the configurations they can be set up, have a solid surface shelf and the price is outstanding at $66.99 at Costco. Some of the featured items on this site occasionally contain affiliate links which help me earn a few extra buckaroos. I write about the things I love and have recommended or used myself throughout my years as a professional organizer.